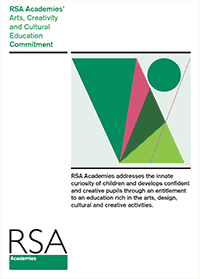 As part of the RSA Family of Academies, our schools commit to developing and publishing a Careers Education, Advice and Guidance plan to share with staff, parents, governors and employers. 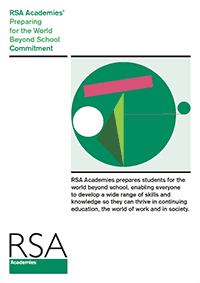 extra-curricular opportunities in both primary and secondary phases to enable the development of skills for the world after school, including student leadership, voluntary work and business/enterprise. partnerships with educational and employment providers, enabling students to have multiple opportunities to learn what they will need to do to prepare for the world beyond school. experiences in different contexts, such as work visits, work shadowing and/or work experience and experiences with providers of the full range of learning opportunities, including Sixth Forms, colleges, universities and apprenticeship providers. Gathering destinations data from year 9 onwards for three years after each student’s leaving date, with the data separated into the main categories of employment, apprenticeship and further and higher education, including Oxbridge and Russell Group universities, as well as gender, ethnicity and FSM. Facilitating at least one encounter with an employer for each year with a range of the following: careers fairs, enterprise events (e.g. mini-enterprises), mentoring by employers, mock interviews and CV writing, ‘speed dating’ events. Facilitating at least one visit to or from other educational institutions such Sixth Forms, colleges, universities and apprenticeship providers. Using a range of assessments to review and identify skills, interests, attitudes and match with career plans.